Often people with disability are regarded as people who cannot do anything in their life, but if someone encourages them to do something then they are the people who could make the most out of their lives. You might have heard about Stephen Hawking. A British theoretical physicist, whose world-renowned scientific career spans over 40 years. His books and public appearances have made him an academic celebrity and he is an Honorary Fellow of the Royal Society of Arts, a lifetime member of Pontifical Academy of Sciences, and in 2009 was awarded the Presidential Medal of Freedom, the highest civilian award in the United States. Stephen Hawking is severely disabled by motor neuron disease. Hawking gradually lost the use of his arms, legs and voice, and as of 2009 was almost completely paralyzed. As you can see, with those many disabilities anyone would think of dying as the best option. But people like him are the ones who show the rest of the world that disabilities are not meant to stop someone's life, they are meant to make you stronger and more stronger. Walt Disney who was an American business magnate, animator, cartoonist, producer, director, screenwriter, philanthropist and a voice actor and yes, he was co-founder of "The Walt Disney Company". Albert Einstein, you all know about his achievements in the field of science and technology. Alexander Graham Bell who was an eminent engineer, inventor and innovator who is credited with inventing the first practical telephone. Thomas Edison a great inventor who had over 1000 patents and his inventions are in various fields used in our daily life could not read till he was twelve. His most popular invention is the electric light bulb. He also developed the telegraph system. George Washington could barely write and had very poor grammar skills and the list goes on. Life is all about doing what you like and spreading happiness in the world. Disability is disability for those who look at it as a disability while some other look at it as a challenge. The meaning of disability varies from person to person. A man named "Jahid" who doesn't have one leg, came in Roadies(a youth-based popular reality television show in India) and got selected, and when you see his audition video and episodes from Roadies then you will be shocked. He has done all those things which would be difficult for even a normal person to do. For his audition video, you can click here.On the day of audition, the judges asked him, "How would you perform tasks when you don't have one leg and you are disable?" to this he replied that "I don't have one leg but I'm not handicap. 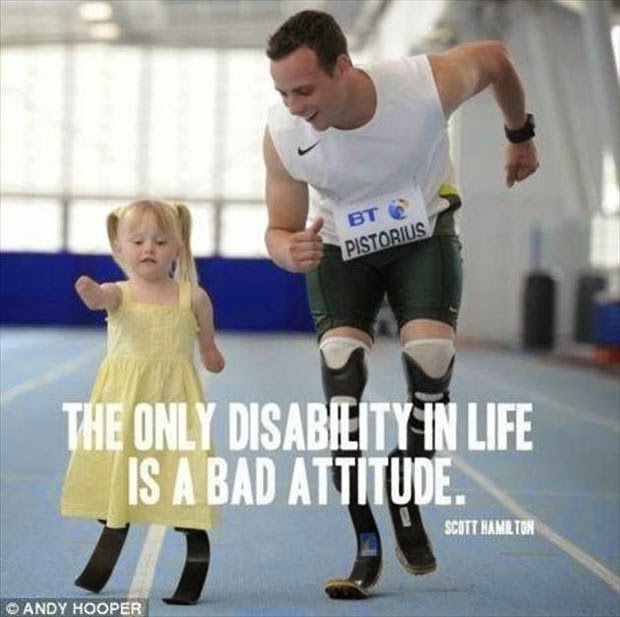 A handicap is a person who cannot do anything and I can do things and can perform task". It is all about how we look at each other and how we look at things. If we have right attitude towards every other person then we can help each other out and make this world a better place to live in. © 2015, Saddam Pojee. Picture Window theme. Powered by Blogger.